Comments: The 3 of us had been out and about, but detoured to the reserve on our way home. The plan was to put the Windjam kite up first. Then, we would get some good pics of our toddler son Aren flying the recently made MBK Kids Diamond. On stepping out of the car it was clear we that this was not going to be a long session, due to the cold wind. Walking south across the field, we stopped briefly to setup the Windjam delta kite, then continued on with the kite in the air. In the brisk breeze, it went straight up almost as fast as I could let out line. Looking around for an anchor point, I decided on using the corner post of the cricket-practice nets. Feeding the reel through the wire netting, it was easy to jam it in a position that would hold the kite. The colorful delta was flying high with 30 or 40 meters of line let out. Now onto the main business! Out came the MBK Kids Diamond, already attached to our 15 meter cotton test line. My wife May got busy checking out the camera angles. A bit tricky, with the kite flying close to the direction of the late afternoon sun. The little diamond kite looped and dived a lot. In the fresh breeze, it really needed more tail for added stability. Never-the-less, we soon had the plastic reel in Aren's hand. He started trotting off downwind, still flying the kite with his left hand. Very cute to watch, there he is in the photo, in mid-stride! To make the kite big enough to see in the photos, we needed to fly it on a short string. Of course that meant a lot of re-launches as it struggled in the fresh conditions and kept contacting the ground. To add a little more challenge, Aren decided that it would be fun to drop the reel and run towards the kite each time it landed! However, May persevered and we ended up with plenty of pics. Eventually, Aren found yet another game to play. It was called 'throw the reel onto the ground and watch Daddy chase after the kite'. Again and again and again. End of photo shoot. With the breeze freezing our collective butts off, we quickly reeled in both kites and drove home. No records were broken, but it was fun watching Aren fly the Kids Diamond kite! Comments: It was a Public Holiday, so after a few hours work on this website in the morning, we headed off to our latest favorite kite flying park. Just a bit of a rustle in the bushes around the house was enough, since most of our kites are good in light breezes. Conveniently, the breeze was from the west so we didn't have to walk far past the tree-line to find a suitable spot to launch the kites. The MBK Sled came out first, and to begin with things looked promising. A gust soon had it in the air and climbing. Too bad I hadn't got around to fixing its hang-to-the-right tendencies though. It was soon on the ground again. Then the wind went really light and variable, sometimes with the direction shifting by 180 degrees! On top of that, there so many thistles and burrs in the grass that the tails kept getting caught. And the flying line would hang up on a thistle from time to time too. Not much fun. Time to forget the sled for a while, and hook up the diamond. Back at home I had attached it to the double-width blue tail for extra visibility. For these very light conditions, the tail was a bit heavy, so again there were multiple launches followed by sagging to earth again. At last a stronger breath of air came through that actually lasted for a while. In no time, the MBK Diamond was sitting pretty at 10 meters or so, while I fiddled around trying to get a burr out of the line. The burr was knotted in tight, and refused to come out. 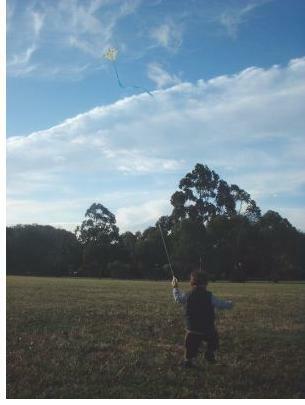 Meanwhile, the kite ran out of puff and had ended up on the ground. I should have just let the burr go for a ride to 300 feet, and worried about removing it later! Never mind. I briefly tried to remove the blue tail, hoping to change to a lighter one but the cotton had separated into strands and the Larks Head knot was too hard to loosen without my reading glasses. Oh well, there's one more kite in the bag... Those tails probably need a heavier kind of cotton line so the larks Head knots aren't so fiddly. It's just a very short length of cotton, so there wouldn't be much extra weight at all. We'll get to it later. There seemed to be thermals popping everywhere, judging by the gusts disturbing the highest treetops in cycles. Perfect for the Windjam delta! Well, it took quite a few attempts before a good gust got it to treetop height. Once there, it climbed strongly in the light but steadier breeze higher up. May started the stopwatch on her mobile phone, since this was a perfect opportunity to break our kite duration record! The delta went straight up to around 300 feet or so. It has a distinctly different feel to my skewer kites, due to the flexibility of its fiberglass spars. They are free-floating too, not being solidly attached to the nose. Give it a good pull, and it absorbs the tension for a second or so before accelerating upwards. After a while, I got a bit bored with a mere 300 feet, so out went some more line. We don't have measurement tags on this line yet, so we don't know for sure how high the kite was. So no setting a height record on this occasion. However, with roughly half the line out, I think the Windjam delta was pushing close to the erm.. legal limit of 400 feet above ground. Yes, it's got to that. To set altitude records from now on is going to require some arrangements with CASA, the Air Safety authority. On that point, we did notice 3 aircraft which flew overhead or close by. Two light aircraft and one jet, all under 3000 feet by my estimation! After 25 minutes elapsed time since we started the stopwatch, it was time to start reeling in. The idea was, we would take ages to get the kite down, and the duration record would be broken by the time we did this. With Aren strapped into pram, I pulled in the 8 kg monofilament line hand over hand while May wound it onto the reel. Doing things like this has 2 advantages. It's fairly fast, and the line gets wound onto the reel with low tension. Remember the last time I reeled the Windjam delta in by myself, and it crushed the plastic reel? We eventually starting winding in again, this time with May pulling down the kite and me winding the line onto the reel. Aren 'helped' May with the pull-down from time to time :-) As the kite got down to about twice tree-top height, we began to hear the fluttering of the tails. Down below tree-top height, there was very little air movement so it bobbed and glided around until gently settling on the grass about 15 meters away. 50 minutes air time! A new duration record.